It’s that time of year again, it’s starting to get a bit warmer and we all franticly rush to the gym to restart those new years goals, or maybe it’s just me lol. Due to my frantic “I need to get in shape” thoughts I did a bit of a fitness shop over the Easter weekend during the sales. I also recently purchased a spin bike for home use, and so will be needing a few extra bits as I go the the gym in the morning and will be using the bike at night. 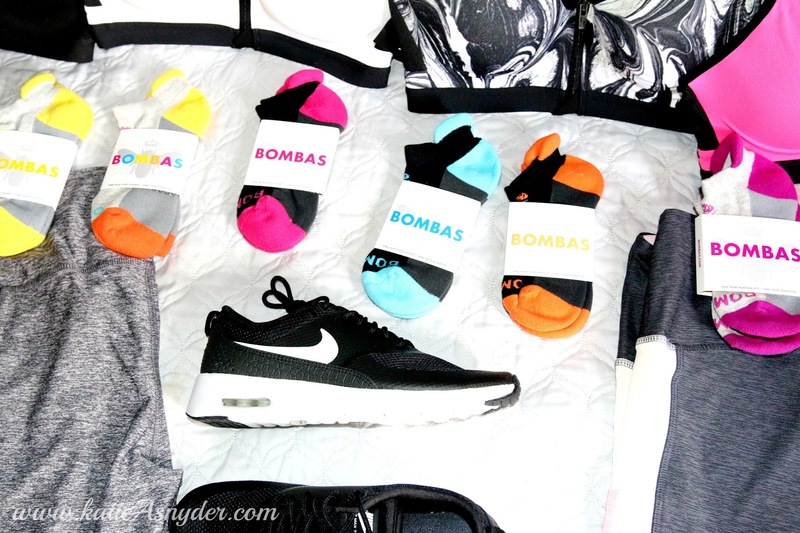 Whilst in spin class a woman recommended Bombas socks. They are very soft, have a blister pad, the heals and toes are nice and thick, and to top it all off they donate a pair of socks for every pair you buy. The only down side is they are quite expensive in my opinion. I also purchased a pair of Nike Thea shoes. I’m so excited to give these a go, as I’ve seen countless people raving about these. I also grabbed a pair of Nike Roche in white. These I’m not sure about, they have a corrugated insole (like a washboard), and the color in real life, has a bit of a grey/super light pink tint to it. At Victoria’s Secret I purchased 4 of their Front Close Sports Bras. I have been in desperate need of these as the sports bras I have now are difficult to get on and off, especially after I’ve worked out and the bra is sweaty. I also grabbed 2 pairs of the High Waist Pocket Leggings and 2 pairs of the High Waist Leggings. I do own a couple of these already and so I was slightly disappointed the new one are made of different material, and can be slightly sheer when stretched. I do however like the added mesh panels for breathability and the pockets fit my iPhone 6S Plus! I can’t wait to put all of this to use, and am especially excited to get my new spin bike delivered as I do spend much of the evening sitting on the couch watching tv lol. Here is the video for this Haul and the Daily Vlog! Also the 9K Subscriber Kylie Cosmetics and Morphe Giveaway is still going on so get your entries in, it ends May 1, 2017. Also this is an international giveaway as are all of my giveaways.